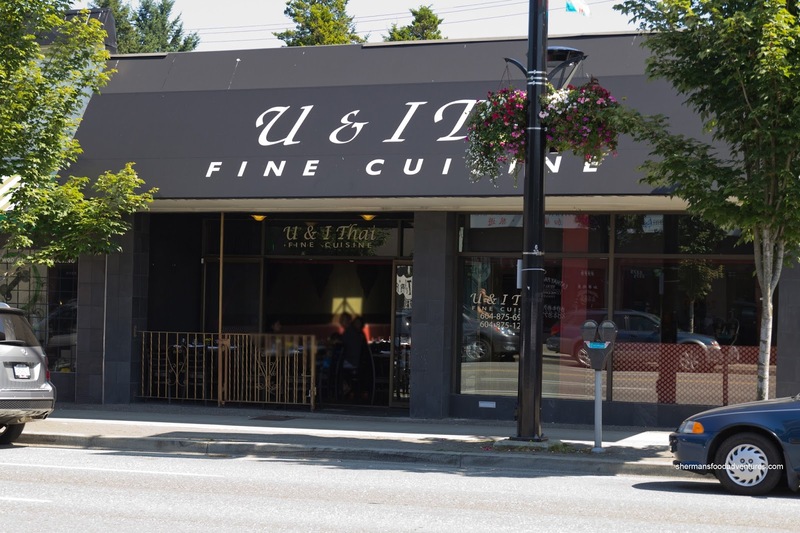 As one of the restaurants participating in the Fried Chicken Challenge, I decided to bring the whole family out for a complete meal rather than going it alone. 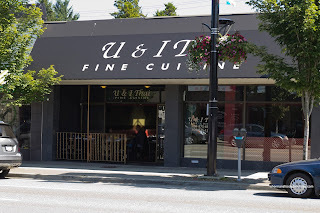 This was as good as any time to revisit U & I Thai since my last post was over 2 years ago. Besides, the only way my kids could expand their repertoire of cuisines is to avoid eating at White Spot all the time. Well, my daughter doesn't have much of a problem there, but my son still would order Mac n' Cheese every time if he had his choice. We did start with something we knew he'd like in the Jumbo Prawns in a Blanket (Goong Hom Pas). 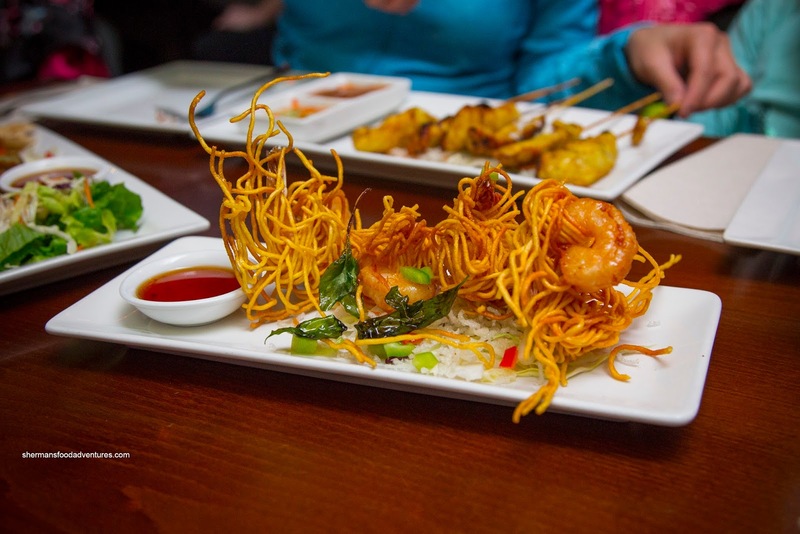 With smallish prawns wrapped in crispy yellow noodles, the dish looked impressive. Well, the noodles were rather crunchy while not showing any ill effects from the deep-fry (lack of grease). However, the prawns were rubbery since the noodles didn't provide enough of a coating to protect it from the hot oil. 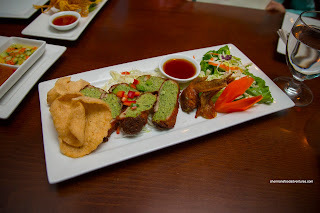 As for the featured dish for the Fried Chicken Challenge, the Pacific Green featured Thai-style fried chicken with snowpeas, spinach, basil, ginger bean thread noodles and coconut milk. The processed meat exhibited a rebound texture with some brightness from the ingredients. I found it lacking a bit of moisture and overall impact. However, the sweet dip did help alleviate the problem to a degree. 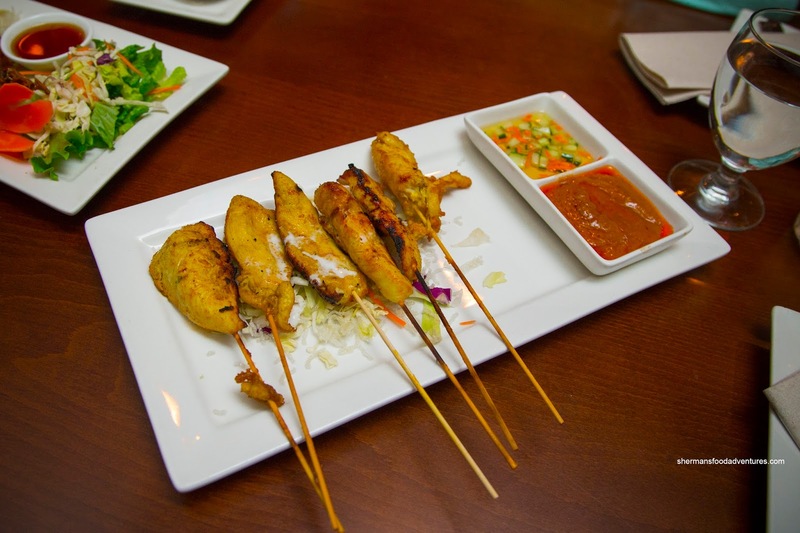 For the kiddies, we got the Chicken Satay because we knew it was safe and they would eat it. By virtue of employing white meat, the satay skewers were a touch dry. The flavours were mild, but there was evidence of coconut milk and the faintest amount of spice. I enjoyed the aromatic peanut sauce as it was neither too sweet nor salty. It was rich and smooth. 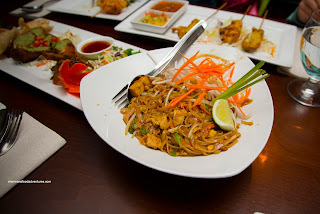 Next, the obligatory Pad Thai was rather saucy (hence the noodles were soft) and full of ingredients. Although it was prepared with tamarind, we felt there wasn't enough of it as the tang was in the background rather than in our faces. However, the bits of pickled turnip helped in that regard as well as the squeeze of lime. Onto 2 dishes that were mainly for the adults, we got the Duck Red Curry with lychee. We asked for it to be mild (just in case the kids wanted some) and it was as such. 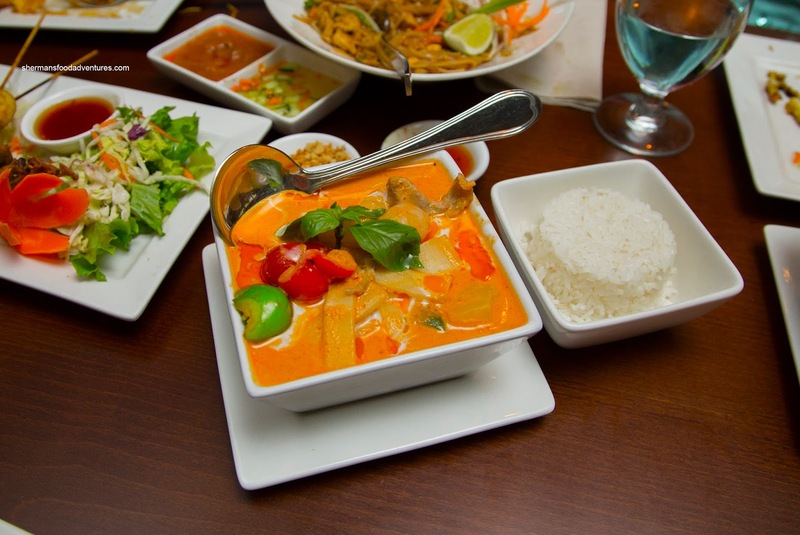 Lightly creamy, coconutty with sweetness and a touch of spice, this was an appealing curry. We would've liked to see more tender pieces of duck though (as it was hard to find). 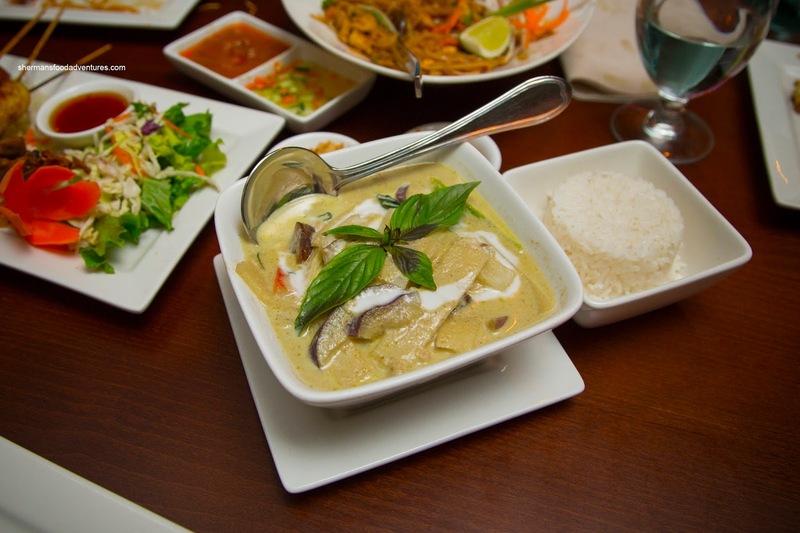 Rich and creamy, the Chicken Green Curry was rather spicy for mild (but that was okay with us). There was a hint of seafoodiness to go with the good balance of saltiness and sweetness. Interestingly, the side of coconut rice was rather small for the generous amount of curry. Much like our previous visit to U & I Thai, our conclusion remains the same - acceptable food with generous portions.